Scooper - Technology News: Indian workers are ready for the robot revolution. But are their managers? How do workers feel about the new era of robots, set to reshape entire economies? This question hardly features in the debate about automation and artificial intelligence. There’s been a lot of speculation as to the impact of technology in the distant future. And that matters because, here and now, some companies are already introducing artificial intelligence and other innovations, and wrestling with the early challenges they pose to management. According to research by Accenture Strategy , workers welcome digital technologies. These include, broadly: social, mobile, analytics and robotic technology, as well as artificial intelligence. Five times as many think digital will improve their job prospects as those who say it will worsen them. And those who believe digital will improve their working experience outnumber the pessimists by 10 to one. Should such enthusiasm surprise us? Perhaps not. Our measure of the digital economy indicates 37.5% of the global workforce can be considered digital. That is to say, there is already a large proportion of employment in which digital skills play a part and that can support digital business activities of one kind or another. Clearly, many of these skills are not yet sophisticated enough to exploit the full potential of digital disruption. But there is a broad foundation of skills that are relevant to emerging digital business models. The rapid rise of the millennial generation – there are in excess of 700 million in India , according to the United Nations – will likely reinforce this foundation and drive even greater openness to the emerging world of robots and artificial intelligence. Already, new intelligent systems are bringing not just greater productivity but greater precision to agriculture, thanks to sensors, drones and other technologies. The finance sector is using robo-analysts to provide financial advice to banking clients. And smart glasses are helping field workers to access data and instructions as they repair equipment. These innovations are not making super-humans. They are making humans super. Artificial intelligence augments the work they do and helps them do it better. In India, professional employees exude enthusiasm and optimism for a digital future. In our sample of 1,000 Indian workers, of whom 93% were graduates and 90% of whom were professionals, 79% believe new technologies will have a significant impact on work. Ninety percent believe that these new technologies will have a positive impact on their work experience, higher than the 63% averaged in the emerging markets Accenture Strategy studied. When asked, Indian professional workers pointed to greater efficiency as the main benefits of digital technologies in the workplace. But greater mental and creative work and the opportunity to learn more also rank highly. Despite the enthusiasm, employees the world over are cautious about the march of robots and artificial intelligence. Just over a third of the workers polled globally are worried that robots and software will take over their jobs. That rises to 60% in India, demonstrating the dislocation of digital progress in the workplace here. Indian workers are also more worried than workers elsewhere that employers can track their every move. Meanwhile, business leaders in India are ambitiously transforming their businesses into digital enterprises. In many countries, especially in mature economies, businesses intend to follow rather than lead, perhaps because digital throws up many uncertainties for traditional sectors who have much to lose and, therefore, much to learn. Indian enterprises may have less to lose and more to go for. Accenture spoke to 100 Indian C-suite decision-makers in a broad range of industry sectors. Almost three-quarters represented companies with revenues of more than a billion US dolllars. Two and half times the number of business leaders in India (in comparison to those in Germany) want their companies to be digital leaders as opposed to fast followers. But there’s a challenge. There may be a degree of complacency about the readiness of companies to transform their businesses into digital enterprises. Two-thirds of local companies say they already have a digital strategy for talent and skills. But evidence throughout the rest of the world demonstrates that, when push comes to shove, there are difficulties among middle managers - those who have to implement changes to the digital workforce. Among the tasks that managers devote most time to today, many are prime candidates for a degree of automation: planning and coordinating work, monitoring and reporting and maintaining standards. Artificial intelligence will increasingly free managers from these time-consuming tasks to focus on work that is more uniquely human, or “judgment work”, which requires complex thinking, interpretation and higher-order reasoning. That could be providing more bespoke services to customers or more personal support to staff. And managers will be liberated to focus more on creativity and innovation. Yet a majority of managers we spoke to around the world are uncertain whether they have the skills to succeed in their role over the next five years. 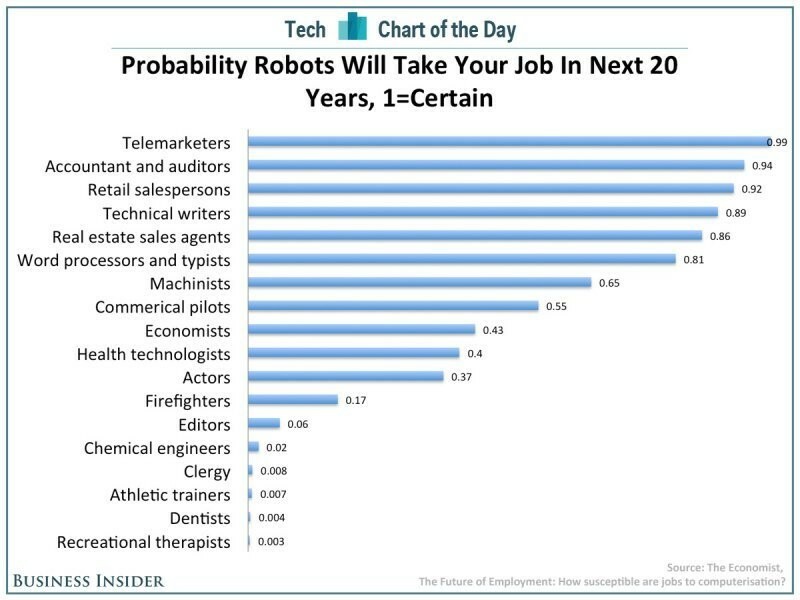 Many are concerned about the impact of artificial intelligence on their jobs. Part of their resistance boils down to trust. When asked if they would trust the advice of intelligent systems in making business decisions, barely more than a 10th strongly agree, putting them out of kilter with their more positive executive-level managers. This calls for a more proactive effort to unite managers and machines. Not only do we need to accelerate the introduction of new intelligent systems, we need to encourage experimentation to mould those systems into the fabric of evolving processes and teams. This approach will show that digital is not something that happens to the workforce but something the workforce makes happen in their organization. The other critical step forward is to shift the expectations for management skills demanded in the future. Managers often misunderstand the full spectrum of skills needed, assuming the greatest impact will be on the IT workforce or that digital skills will be the most important. In fact, the most critical skills required as AI and robots make their presence felt will be people development, coaching, collaboration and creative skills. Above all, stronger interpersonal skills will be paramount if managers are to have the confidence to inspire a more fluid, less structured workforce and to manage the introduction of new technologies in the first place. These hard-to-come-by skills will be needed so that managers can support their teams as they learn to work with robots and as robots learn to work with them. While India is open and receptive to digital transformation, it may require a more nuanced and advanced approach to developing the core managerial skills to succeed.